Whitfield Lovell: Kith and Kin presents the artist’s ongoing exploration of the African American experience through an installation of his most recent series of charcoal portrait heads on paper and new three-dimensional tableaux of charcoal drawings on vintage wood. Both groups of artworks incorporate found objects, creating bold constructions with a strong sculptural presence that invoke issues of cultural heritage and personal identity. 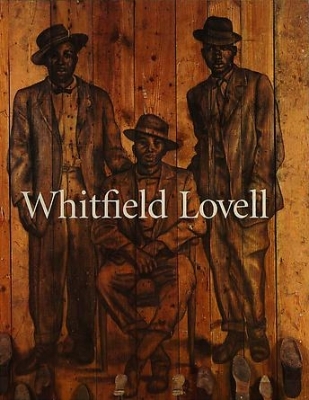 Inspired by his fascination with history as well as by stories told by his grandparents, Lovell’s work illuminates the humanity and richness of anonymous people, engraining their legacies in our cultural memory. “The importance of home, family, ancestry feeds my work entirely,” Lovell has said. “African Americans generally were not aware of who their ancestors were, since slaves were sold from plantation to plantation and families were split up.” His drawings are generally based on photographs of unidentified African Americans, most dating from the early twentieth century. In the Kin series of works on paper, finely rendered portrait heads paired with enigmatic objects convey an intensity that gives the individuals and their lives a sense of specificity, creating a tangible presence that establishes an empathetic connection with the viewer. Among the new tableaux in the exhibition are installations that feature images of black soldiers from the World War I era. It is a theme of increasing importance to Lovell, who wonders why someone would have enlisted to serve a country that did not afford him basic human rights. The inherent contradictions in their status as military men at that time focuses attention on concepts of patriotism and community service, as well as practical concerns of the economic and educational opportunities that enlistment offers to underprivileged and disenfranchised populations, all issues that are particularly relevant to the current global political climate. Lovell’s current tableaux have developed out of a series of works created over the decade, such as the critically acclaimed Whispers from the Walls, which originated in 1999 and traveled to seventeen venues across the country, including the Seattle Art Museum, The Studio Museum in Harlem, and the San Antonio Museum of Art. Recent exhibitions in which his work has been featured include, Provocative Visions: Race and Identity-Selections from the Permanent Collection at the Metropolitan Museum of Art, on view now and continuing through March, 2009; Art For Yale: Collecting for a New Century at the Yale University Art Gallery; Still I Rise: African American Art from the Collection at the Columbus Museum of Art in Ohio; and Works from the Permanent Collection at The Studio Museum in Harlem, all in 2007. Lovell is a 2007 recipient of the John D. and Catherine T. MacArthur Foundation’s Fellowship Award. Whitfield Lovell: Kith and Kin continues at DC Moore through November 8, 2008. A concurrent exhibition, Whitfield Lovell: All Things in Time, is on view at the Hudson River Museum in Yonkers, New York from September 27, 2008-May 10, 2009.